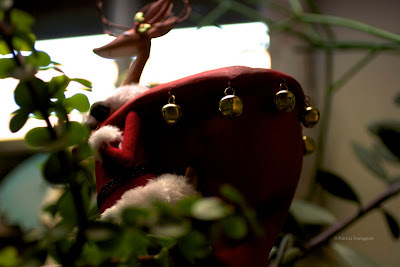 The Last Leaf Gardener: Friday Follow Up: "the reindeer effect"
This past Tuesday on tumblr, (where I "send" TLLG Blog Spot followers on Tuesdays), I wrote about "the reindeer effect" in relation to a reindeer figurine, who lives in my indoor succulent garden, and I accompanied what I said with the following image of that particular reindeer. 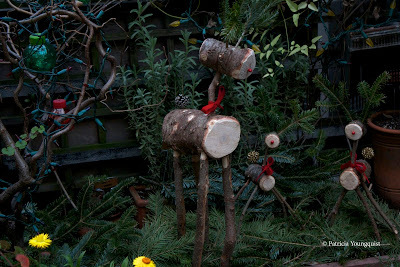 Today's post has to do with some reindeer that are new arrivals to my urban (NYC) terrace garden, and who can be seen in the photograph at the top of today's blog entry. As you can see, from the aforementioned photograph at the very top of this blog post, Mama Reindeer and her twins seem to be marveling at the fact that my Helichrysum bracteatum AKA Strawflowers (the yellow flowers which can be seen in the lower lefthand corner of that image) are still blooming when it is currently mid December. And they are enjoying the scent from the Lavandula dentata (French Lavender) which is still thriving directly behind where the newly arrived reindeer are standing! that they seem most concerned indeed, and I am quite touched to think that they seem to have such a concern for their environment! 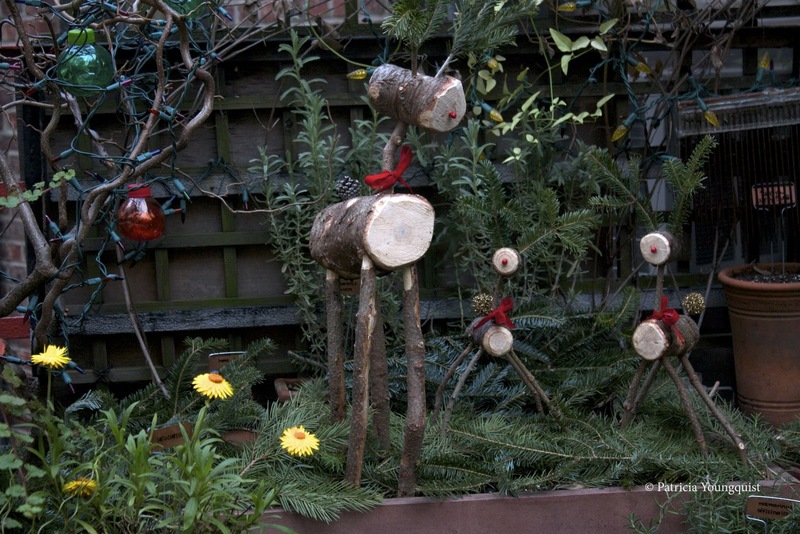 It seems to be in these three visiting reindeers' genes to have a concern for the planet; after all, each one of them has a body made of a trunk from Christmas trees being sold in my New York City neighborhood. 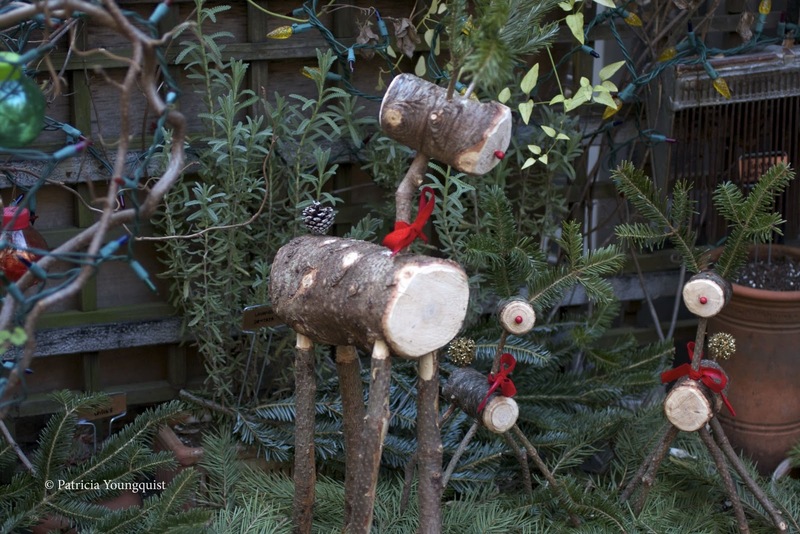 Their little legs are also made of pieces of Christmas tree trunks, and their antlers are made from Christmas tree branches. Moreover, their tiny tails are each made from a pine cone. This is why — the fact that they are made from "recycled" parts that are tossed from Christmas trees — I assumed that they were totally consumed with environmental concerns. 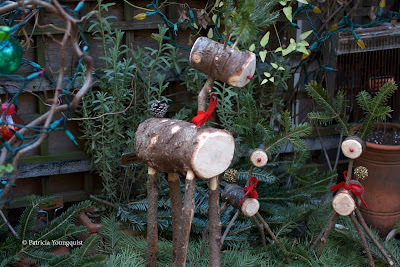 But, alas even my reindeer have their price! 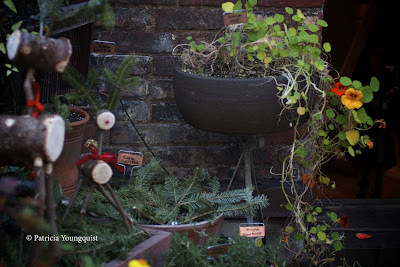 This is evidenced in the image posted below of the three of them eyeing my Tropaelum majus (Nasturtium), which is also still thriving in mid December. I always find my Tropaelum majus is much too pretty to eat, although many folks do put them in salads and incorporate them into a number of recipes. I still prefer them to be a source of inspiration for blog posts on TLLG (which you may read by clicking here). I hope the visiting reindeer also find my Tropaelum majus's flowers inspiring, and all I can say to them, which is a modification of the "famous expression" Please Don't Eat the Daises is . . . . . . [drum roll] . . . you guessed it, Please Don't Eat the Tropaelum majus!